Really. I dunno about that meng. ATK +20% at start of each turn (up to 80%) , IBetter passive at least it takes 5/6 turns to build up. That Free super attack is just tooo sweeeeeeet. I just got that GT goku from the WT SSR banner during the weekend. Guess I better train up his SR counterpart for that 50% SA chance now. It's at the start of the turn for the card, which means you need to skip the turn they aren't there. This means the passive builds up on turn 1, 3, 5 and 7, thus averaging ~8 turns when considering random starting rotations. Banpresto SSJ4 Gogeta statue for preorder. Hmmm... I wonder. Is this the part 2 LR? I wouldn 't put it past bandai to present a "surprise" LR for ss4 gogeta, and omega/shadow dragons; maximum wallet openers. I am patiently waiting to see how it all goes down. Nothing from the banners so far, sadness. Reward stones coming in clutch, got ss broly from it. Was kinda looking for agl broly too though. 13 multis only 6 featured, but at least my phy omega is now also rainbow and I got my first phy ss3 gotenks and ss3 broly; have all proper leads now cept movie heroes, future saga and transformation boost. All these free stones and still no agl broly. Bought some extra for the upcoming valentines banner. Well, LR boujack completely destroys eza gogeta so that was easy. Kinda miffed that bulla isn't featured, that's the entire reason I waited for this banner. But at least I got brianne. Also there's only girls on this banner, even unfeatured, so I also managed to rainbow kefla. more excited for the galick gun duo eza honesty, having them both on rotation should be devestating. The only one of the EZA duo I still have is the Trunks at SA 6 no dupes, I think I used the Vegeta as SA fodder for his int counterpart last year not thinking he'd ever get an EZA. That's a serious haul for me. 5 multis. 2x new int vegeta, everything else trash. Ouch. If it's a consolation, I wanted INT Vegeta but didn't get him. int super vegeta is pretty dope tbh. He hits for 1.4 mil with one dupe on double ssbe leads and tanks for 105k def. Pure saiyans more and more becoming the team to beat. Used the royal thingies to get one more dupe for both vegeta and trunks, have them both at 2 dupes now, but really running low on kais, need to start farming some of these events again. Well, disregard the above. Did two multis, the discount one only got me the AGL ROF Goku SSB. And the second mulit got me the new Int Vegeta and finally the PHY Lord Slug. Been looking for that guy so that I could finally use his teq counterparts (that had been taking up space in my collection box for months) as SA fodder. So I'll stop here until i hit the stone packs tomorrow. No clutch on the top grossing. This must've been the easiest eza of all time, didn't take any damage 1-30. I really want to keep chasing phy vegeta, simply cause I really want to run the galick gun duo together, but db heroes is releasing in like a week and I'm definitely expecting some kind of surprise banner. 3 multis on coola, 3x unfeatured gssr trash; guess I'm back in bad luck mode. Rainbow EZA beerus reaches 3.19m atk on 150% lead with all links active and 35% support, pretty wild, but not consistent. If you have LR beerus and another support on rotation, you'd prolly easily hit 4+m every rotation. Bring on that LR Kale and Caulifa, meng. I'm ready. 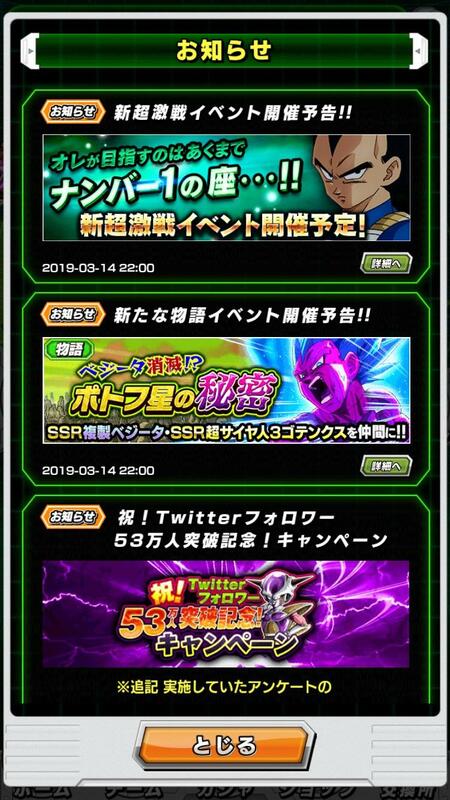 LR kale and cauli prolly won't be a featured one so I'll never get them, but they look nice.